What is the origin of a shawl? The production of our items is done in our family owned factories in Srinager, in the north of India in the mountains of Kashmir. This region is famous for its quality of the wool; also called cashemere. It is because of this extraordinary quality of the yarn, the quality of the wool, which we direclty obtain from the goats which are roaming the Kashmir hights, that for generations the people in this area are involved in yarn and wool based products. The first official documents about shawls have been found around the 7th century: a pelgrim called Xuanang was on travel in Kashmir and has written home raving about this yarn quality. But the shawls that Xuanang has seen were without any doubt not comparible to the shawls that we know today. Most probably these were very primitive and simple woven shawls of rough untreated wool. It was only in the 15th century that the production process started to professionalise. There is a theory that the Sultan Zain-Ul Abidin (1420-1470) has created the circumstances that the weavers got an opportunity to really develop themselves. The later emperor, Mughal Akbar (1526-1605) was a huge fan of the shawl. He made sure that every single day he was wearing a different one, which was copied quickly by the than Jetset, making the shawl very popular instantly. It took all up till the 17th century before professional production started. 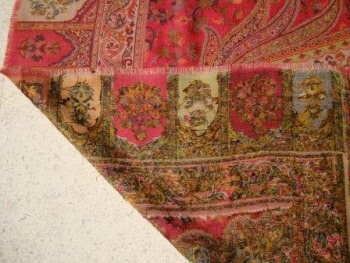 In those days it was very common to give a shawl to visitors from outside India as a souvenir. Especially the Sutlan of Delhi, Muhammad bin Tughlaq, has distributed many shawls among his foreign guests. These people handcarried the souvenir shawls back to their origin, where the shawl was an immediate hit and gained instant popularity.